In her Guardian comment piece, author Dreda Say Mitchell, a Brexit supporter, says that she and other BAME Brits who voted leave did so partly because they wanted a fairer migration system for the UK, one that did not favour EU citizens over non EU citizens. She goes on to say that if Mrs May will not deliver that fairer migration system, then many BAME Brits who voted leave will feel betrayed. Unfortunately, that betrayal is already evident. The vote in favour of Leave has been interpreted by Mrs May as a mandate to cut immigration and to reach that magical (mythical?) figure of 100,000 net migration per year. 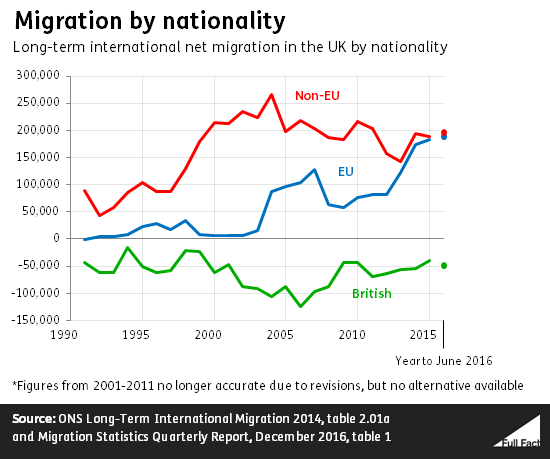 Non EU migration has been consistently higher than EU migration and the most recent figures put it at 170,000. So even if EU migration was stopped entirely (rather unlikely), the government would need to cut 70,000 from non EU migration and it appears they have every intention of doing that. Some who voted Leave believing it would make non EU migration much easier have already realised they were betrayed. For example, curry house bosses promised easier visas for curry chefs by Tory Leave campaigner Priti Patel MP have already realised they were deceived and are quite angry about it. And just in case there is any doubt, Labour MP Rupa Huq asked a question in parliament and was told there were no plans for the “curry chef visas” Ms Patel promised voters. In criticising EU free movement, Ms Say Mitchell does not acknowledge that it is RECIPROCAL and that millions of Brits have gone to live in other EU countries. In addition, there are of course millions of BAME EU citizens and some of them have even come to live in the UK (I’ve met Germans of Turkish descent, Danes of Iranian background, Swedes of Korean background, and French citizens of North African heritage, to name but a few). There was and still is nothing preventing the UK government from having the same freedom of movement with non EU countries. In addition, Ms Say Mitchell has also (like millions of people in this country to be fair) fallen for the lie that EU free movement was “uncontrolled” or even “uncontrollable”, which is patently false. EU free movement is conditional and the UK government could have chosen to impose those conditions, but never did. Mrs May had six years in the Home Office to implement a system of control of EU free movement as other EU countries do (I experienced it myself as an EU migrant in Belgium), but she chose not to do so. I strongly suspect that Mrs May actively chose not to control EU free movement so she could use it as an excuse for her failure to get net migration down to 100,000. It also allowed Leave campaigners to claim that EU migration was “uncontrolled”, that non EU migration had been hit as a result, and that voting Leave was the only way to remedy the situation. From her comment piece, it seems that Dreda Say Mitchell was convinced by that argument and believes that many BAME Brits who voted Leave were similarly convinced. She also gives the impression that this may have been decisive as she warns that BAME voters may “switch sides” if the promised fairer migration system is not delivered. Unfortunately, as far as the government and Leave campaigners are concerned, it doesn’t matter if Dreda Say Mitchell and millions of other Leave voters now decide to “switch sides” because promises made (fairer migration, £350m a week for the NHS etc) are not delivered. The government has decided that the (second, non-legally binding) referendum on EU membership is set in stone and unlike other democratic decisions, it cannot be revisited. As a Liberal Democrat Remain campaigner, I disagree; any democratic decision that cannot be challenged through democratic means isn’t democratic at all. Mrs May’s renewed emphasis on cutting immigration at any cost is perhaps an attempt to atone for her previous failure at the Home Office. And while it was clearly not intended as such, Ms Say Mitchell’s vote has greatly helped Mrs May in her endeavour. I said many times during the EU referendum campaign that the real agenda of many ToryKip Leave fanatics was to turn the UK into Sweatshop Britain – a tax haven with low levels of worker’s rights and minimal safety and environmental standards.This was often dismissed as (guess what?) “scaremongering”. Tory Minister Priti Patel suggested losing half our employment rights could boost the economy. Ex DWP minister Iain Duncan Smith refused to confirm he wanted to scrap paid holidays and limits on working hours. Remain campaigners like Labour’s Hilary Benn asked Leavers to say which worker protections they would scrap (they wouldn’t say). And now this agenda has been confirmed by Chancellor Phillip Hammond, who is “threatening”other EU countries with the spectre of a tax haven sweatshop Britain. COULD IT BE ANY CLEARER THAT TAX HAVEN SWEATSHOP BRITAIN IS THE ULTIMATE AIM OF THIS TORYKIP GOVERNMENT? But wait a minute, didn’t PM May claim a (non-existant) mandate from the EUref ballot paper, namely that of delivering “change” in order to make Britain “a country that works for everyone”? Turning the UK into a tax haven sweatshop is the very antithesis of country that works for everyone; it’s a country that enables big corporations to call the shots and exploit workers. This is most definitely NOT what many Leave voters thought they would get from Brexit. In fact it seems like the opposite of what was promised. It’s also the antithesis of what Jeremy Corbyn’s Labour party claim is their vision for Britain. Will this be the moment when the Labour party wake up from their Tory Brexit cheerleading and join the Liberal Democrats, Greens and SNP in opposing this Torykip government and its damaging plans for the country? The battle for the soul of Britain has begun, and it’s one we can’t afford to lose! Radical idea on EU free movement: use conditionality that already exists! I’ve got a radical idea on how to amend EU free movement in the UK: let’s use the conditionality that already exists! Despite many Leavers insisting that the referendum was about sovereignty and taking back control and not immigration, it appears that the only thing that Theresa May’s government believes people want to take back control over is EU free movement. All you Leavers out there who disagree with the government on that and e.g. think the Single Market is important; you’re being AWFULLY QUIET. 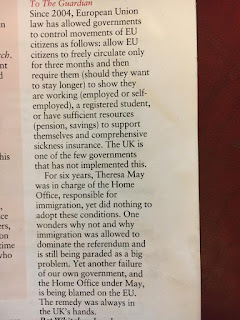 Now it appears that many in the Labour Party and even one former Liberal Democrat MP, Dr Vince Cable (who fought against illiberal/ideological immigration policy while Business Secretary in the Coalition government) agree with the government that EU free movement has had a negative impact on the UK (evidence that even Migration Watch can’t produce, see below), and has to change or be scrapped. So UKIP’s view on EU free movement (EU migrants are to blame for EVERYTHING!!) now appears to be shared by others, despite the lack of evidence, which is quite frankly A DISGRACE. But what NONE of these converts to the anti-free movement cause mention is that there is considerable conditionality to EU free movement that the UK HAS NEVER BOTHERED TO USE. And No Vince I’m not talking about transitional controls when new countries join the EU. This is one reason David Cameron struggled to persuade other EU leaders that the UK needed special conditions for EU free movement. That and his utter failure to unearth ANY evidence whatsoever that free movement had a particularly negative impact on the UK. Even the anti-immigration pressure group Migration Watch when asked to help Number 10 could only come up with one local newspaper article about pressure on a hospital in Corby! (see article here and scroll down to the paragraph “evidence what evidence?”: http://www.politico.eu/article/why-we-lost-the-brexit-vote-former-uk-prime-minister-david-cameron/). 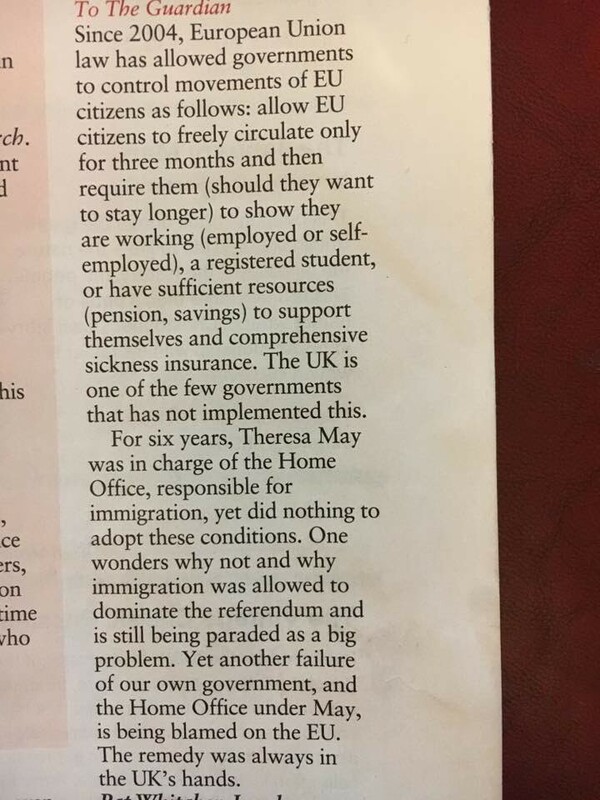 Allow EU citizens to freely circulate in the UK only for 3 months and then require them (should they want to stay longer) to show they are working (employed or self-employed), a registered student or have sufficient resources (pension, savings) to support themselves and comprehensive sickness insurance e.g. valid European Health Insurance Card enabling the NHS to claim back the cost of treatment or private health insurance. It can’t be that bloody difficult given that other EU countries manage to do this! So Vince Cable, Keir Starmer, Andy Burnham etc, stop pandering to UKIP/anti-immigration sentiment and instead make some suggestions as to how existing free movement conditionality could be implemented in the UK. Any EU citizen intending to stay in Belgium longer than 3 months has to register with their local council. The local council will only allow you to register if you meet the conditions outlined above about being in work/being able to support yourself and having sickness insurance. (I showed my employment contract and my registration with a Belgian mutual health fund). Without being registered, you’re not in the Belgian system, so ineligible for social security, unable to get any credit, unable to sign a rental lease etc. etc. After an initial 3 month residence card, you go back and get a six month card (assuming you can still prove you’re working/can support yourself etc.) and after six months you can get a five year residence card. Once you have a five year residence card, then you’re pretty much treated as a Belgian. * I lived and worked in Belgium from 1998 to 2009 (long before I was an MEP) so I have personal experience of this process. Posted in Blog	| Comments Off on Radical idea on EU free movement: use conditionality that already exists! As a Liberal Democrat who went down to Richmond Park and North Kingston on a number of occasions to help Sarah Olney’s campaign to unseat Zac Goldsmith, I am of course delighted that she became the constituency’s new MP on Thursday. First is first, kudos to the Greens and the Women’s Equality Party for not standing candidates and for supporting the LibDem campaign. Also a big thank you to all the non-partisan pro-European activists who came to Richmond to help. The idea that this was merely a strong Remain voting constituency having a chance to reiterate their 23 June vote is a simplistic and somewhat lazy interpretation. 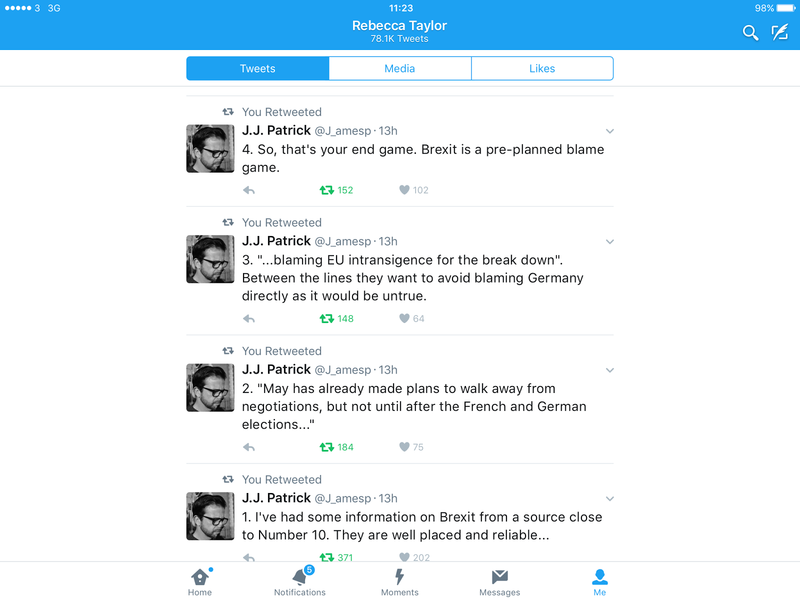 Britain’s relationship with the EU wasn’t the only issue the LibDem campaign highlighted. The Libdem very long term (over 20 years) opposition to a third runway at Heathrow airport and our criticism of Tory underfunding of the NHS also featured heavily. And while the LibDem campaign deliberately chose not to mention it at all, Mr Goldsmith’s horrid divisive London mayoral campaign against Sadiq Khan didn’t do him any favours. Some voters did raise it on the doorstep and it was never in a positive light. I would imagine that the nasty anti-foreigner rhetoric coming out of the Tory party recently e.g. naming and shaming companies that employ non Brits etc will have been similarly received in Richmond as Mr Goldsmith’s mayoral campaign. Perhaps the UKIP-isation of the Tory party will lose more moderate Tory voters than it will gain rabid Brexiters back from UKIP? And you can guess where I think those moderate Tory voters will head. Even on the issue of Brexit, it isn’t as clear cut as the anti-Europeans would have you believe. Liberal Democrat canvassing shows that some Tory Leave supporters voted for Sarah Olney on Thursday. If you live in a very pro-Remain area like Richmond and you voted Leave, then you must have been pretty convinced about it. Yet less than 6 months later, some of those people decided to vote for an unashamedly pro-European Liberal Democrat? 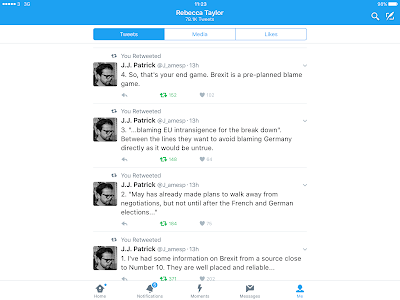 The Brexit tide is turning, albeit very slowly…. Posted in Blog	| Comments Off on What are the Brexiters scared of?